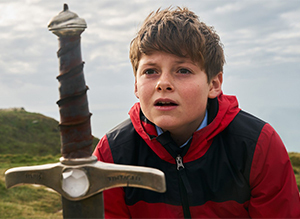 There are several reasons to be excited by The Kid Who Would Be King. For one, it’s a smart movie that deals with some of the harsh realities of being a kid (including bullying and absent parents). But it takes those real-world issues and puts them in a fantasy scenario loaded with good-natured humor that makes the message behind it all (involving themes of leadership and character) so easy to swallow. For another, it’s an original story. Nope. This one’s not based on the latest Young Adult trilogy craze. But it does have its roots in literature. As in source material that dates back more than 500 years (the works of Thomas Malory) and legends that date back more than 1,500 years (thanks to King Uther Pendragon and his son, who’s best known as King Arthur). Most importantly, though, The Kid Who Would Be King introduces moviegoers to a whole slew of fresh faces that will likely grace the screen for decades to come. The kids are all relative newcomers. Some TV work here. Some voice work there. Some uncredited appearances. This movie represents the big breakout for all five of the child leads. And they’re all mighty, mighty good. Savor their performances alongside the legendary Patrick Stewart (Star Trek: The Next Generation) as a haggard, older Merlin and Rebecca Ferguson (Mission: Impossible – Fallout) as Arthur’s e-vil half-sister, Morgana. Yes. That’s spelled E-VIL. Pure and simple. The Kid Who Would Be King calls to mind Terry Gilliam’s classic Time Bandits and, yeah, maybe a little bit of Bill and Ted. There’s an appreciation for history, a devilish sense of humor and a solid coming-of-age scenario filled with adventure and character-building experiences. In this case, Alex (Louis Ashbourne Serkis, son of motion-capture performance genius Andy Serkis) is a good kid who gets bullied once too often. With his best friend, Bedders (Dean Chaumoo), held upside-down and captive to the school bullies, Kaye (Rhianna Dorris) and Lance (Tom Taylor), Alex takes a stand and pushes back. A little scraped up in the process, Alex also resigns himself to a world in which there are no heroes. King Arthur, Luke Skywalker, Harry Potter. They’re all heroes who benefit from a bloodline, a lineage of heroics and adventure. But Alex’s mom (Denise Gough, Colette) generously wraps his father in an enigmatic description of a man who had his own battles and fought his own demons. The man was no good. As for Alex, he’s the chosen one based on his own heart and soul, not his bloodline. With an eclipse a mere 4 days away, Morgana and her dark forces see their opportunity to plunge world into a wholly new level of darkness. But a hero will rise. And he’s 12 years old. It’s a dark time for planet Earth. Dictatorships are on the rise. The world is in chaos. Specific to the United Kingdom, throw in Brexit and there’s plenty of modern context to wrap around the familiar story of the sword, the knights, the Lady of the Lake and chivalry. Here, it’s a decidedly kid-friendly take on the Chivalric Code. But it’s refreshing, nonetheless, to have that serve as the benchmark for what determines the right course of action. Part of it is the all-to-rare capacity to turn enemies into allies – and the need to persevere until the very end. Bridge building and dedication to a cause. Quite the novel concepts for a kids’ movie. But this one is written and directed by Joe Cornish, who wrote and directed Attack the Block and also co-wrote the screenplays for Ant-Man and The Adventures of Tintin. He’s a smart writer, to say the least. It’s a risky proposition to make a movie like this. With such a kid-heavy cast, the risk of the movie turning into a forgettable hodge-podge with lofty ambitions is front and center. The performances from the young actors can either make or break a movie like this. Here, they make it. Big time. And most notable of them all is Angus Imrie as the young Merlin. He’s a 16-year-old who’s completely out of place in modern England. And Imrie owns the role, a guy who comes out of nowhere and delivers with gusto a whimsical spin on an Arthurian legend.